The Honda CR-Z is not your typical hybrid. 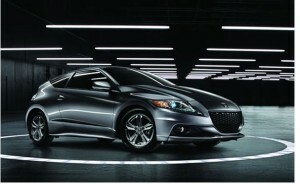 First introduced for the 2011 model year, the CR-Z has the look of a sporty coupe along with tight steering and speedy performance. This is a car for any driver who has wanted the improved fuel efficiency of a hybrid without the reduced performance. The CR-Z is a car that should turn heads as you drive down the street. Before the CR-Z was released, Honda had been playing with the idea of a sportier hybrid for some time. They had released the first mass-produced hybrid to the American marketplace in 1999, the Honda Insight, but wanted a hybrid drivers could get really excited about. They put out two sporty hybrid concepts called the Remix (shown in 2006 at the LA Auto show) and the Honda Small Hybrid Sports (at the 2007 Geneva Motor Show). The CR-Z name first appeared in 2007 as a concept car. A few other concept versions followed it, and the production model finally debuted in 2010 at the North American International Auto Show held in Detroit, Michigan. Vehicles are available in two different trims, the base and EX, while the top trim can also be equipped with a package featuring navigation. Bluetooth connectivity is standard for all current CR-Z models along with a rearview camera. If you want to know more facts about the latest Honda CR-Z models currently available, come to Bosak Honda in Michigan City. Our dealership is at 710 US 20, not too far of a drive from the great Merrillville area. We also carry a variety of other Honda hybrid models, both new and used. Feel free to contact our dealership with any questions. * 36 city/39 highway mpg rating for CTV models. Based on 2014 EPA mileage ratings. Use for comparison purposes only. Your mileage will vary depending on how you drive and maintain your vehicle.